Like most professions, getting that first job with Major League Baseball can be a daunting task. Not only does a person need to have all the skills, contacts and education necessary to stand out, a candidate needs to have a clear expectation of where his or her career in the game will go. 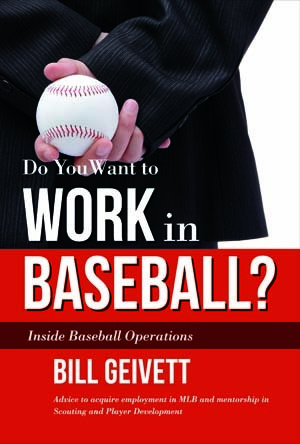 This excellent book by Bill Geivett will give the reader advice and guidance in order to pursue a career in the game. Drawing off his extensive experience as a scout and director for nearly every level of the game, Geivett doesn’t just tell the reader what he or she needs to get that first interview or to land an entry level position. He also provides inside information how what major league clubs evaluate and develop players so that the team will eventually become a championship club. By providing the details of how teams break down players during their development, Geivett shares valuable information and lessons he learned to people who have aspirations to work for a club. There are three main sections to the book. In the first, Geivett provides many tips and requirements a person needs to secure and be successful in an interview. He explains how that first job is just that – a first job toward the eventual career goals that candidates must determine for themselves. He then provides the details of the two major areas of employment opportunities – scouting and player development. In both of these areas, Geivett mixes analysis of the tools used by these areas, detailed analysis of how players are graded in all areas (both pitchers and position players) and how weaknesses of players can be overcome with strength in other areas. In the end, it will be up to the scout or player development staff member to determine how he or she will use all this data and information to grade out a player. While he also shares many stories about his work with players such as Shane Victornio and Vinny Castilla, he does end each of these sections with a challenge to the reader to use these pages in his or her own way to grade each player. This book is a must-read for any person who is interested in a career in baseball without becoming a player. In fact, some of the advice in the first section is valuable for anyone who is seeking employment in any field. The only thing that is close to negative that I can say about this book is that I wish it had been published about 35 years earlier – if that had happened, my career path would have certainly taken a different turn!